virtualpolitik: Who are the Digital Natives? There's a panel at the Modern Language Association called "Digital Immigrants Teaching Digital Natives" that seems to rely on a stereotype that Siva Vaidhyanathan recently declared to be a "Digital Myth" in the Chronicle of Higher Education. Ethnography long ago realized that the status of the "native" is always hybridized in a number of ways, so its strange to have pedagogy absorb the language of anthropological metaphors that are no longer used. In teaching my own Digital Rhetoric class, often I found myself more commonly in the role of helping recent arrivals to particular corners of cyberspace assimilate or trading knowledge with my more tech-savvy students in an atmosphere of Socratic dialogue, so this situation imagined by the panel seems hard to envision. Nonetheless, it's probably true that there are certain areas in which knowledge transfer doesn't follow the conventional future-forward generational lines of supposedly traditional culture in which cultural memes pass from ancestor to descendant over time. A case in point often cited is videogames, which I have argued families should play together, although parent neophytes might find that they need to have the humility to take some pointers from their kids. 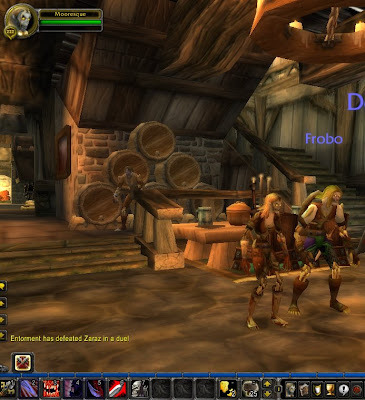 This holiday I've been playing World of Warcraft with my twelve-year-old and have enjoyed teaming up with him to fight various virtual foes. (Besides, I'm disinclined to join a guild in the game and have little hope of gaining competitive advantage otherwise.) Since he's logged more hours on MMORPGs than I have, he's obviously an asset to me in a number of ways, such as knowing to set up keyboard shortcuts for common attack and defense moves. But I'm also struck by some of the adult advantages of life experience for game play, which include being able to read maps, follow complicated written directions, avoid unnecessary conflict, and engage in financial planning. As Espen Aarseth argues in the case of virtual economies, MMORPGs illustrate how difficult it can be to untangle the "real" as a separate category of experience, when we are constantly engaged in many kinds of rule-based cultural fictions in our daily lives. In other words, nowadays, what forms of expertise are purely "digital" and which are purely "analog"? Furthermore, parents often find themselves serving as informants for their own parents, so they are hardly immigrants in that situation. I often have to explain certain features of web-based applications to my senior citizen parents, just I watched my own father explaining escalators and airline travel to his mother. There are complicated exchanges that take place in the social dynamics of families and classrooms around technology. My kids know relatively little about computer programming, which I took as an actual academic subject when I was their age, just as I rely on graphical user interfaces that my father poo poos, as a product of FORTRAN and the slide rule. Similarly, my students are so dependent upon proprietary software, that "naturalness" is perhaps worth interrogating.